When raising the price of a lifesaving drug from $13.50 to $750 -- and being hit with unrelated fraud charges for a Ponzi-like scheme -- isn't enough to garner (negative) attention from the public, the logical next step is to harass a reporter on Twitter. At least, that seems to be the plan of notorious pharma bro Martin Shkreli, the former Turing Pharmaceuticals CEO known as much for his cynical worldview as he is for his outspoken social media presence. 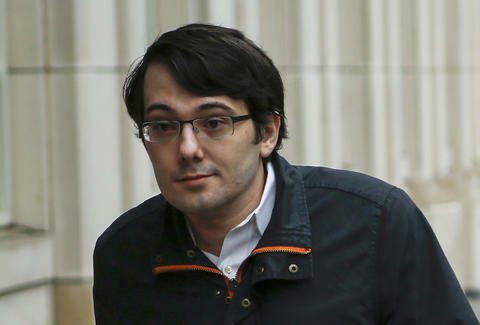 Oh, and don't forget this is the guy who bought the only copy of a Wu-Tang Clan album for a mere $2 million. Seems like a chill dude. So how does a man who has everything spend his free time? By creepily harassing a reporter on Twitter, of course! Shkreli turned his sights on reporter Lauren Duca, who became well-known after her Teen Vogue article "Trump Is Gaslighting America" went viral. In a screenshot posted to Twitter, Shkreli, a vocal Trump supporter, asked Duca if she wanted to accompany him to the inauguration. This set Shkreli off on a stalker-level string of harassment: He Photoshopped himself into a photo of Duca and her husband and used it as his Twitter profile pic, adding a collage of photos of Duca as his banner image, and changing his bio to read "I have a small crush on @LaurenDuca." After Duca tweeted screenshots of Shkreli's updated profile to Twitter's CEO Jack Dorsey on January 8th, the pharma bro troll's account was suspended. Twitter told The Verge that Shkreli was temporarily suspended, and it was related to his harassment of Duca. Although it's unclear if and when Shkreli will return to Twitter, his suspension addresses a larger issue of female media personalities being targeted and harassed on social media. "Trolling seems to be an automatic occupational hazard for female writers who receive any level of professional attention. That's something Twitter needs to work harder to fix, but obviously the problem runs far deeper," Duca told The Verge in a statement. Hopefully Shkreli treats his Twitter presence like he did his role as Turing Pharmaceuticals' CEO, and steps down for good amid a scandal. Christina Stiehl is a Health and fitness staff writer for Thrillist. She is not banned from Twitter, so you can follow her there @ChristinaStiehl.